Designed to imitate the sound of a hot, overdriven tube amp. 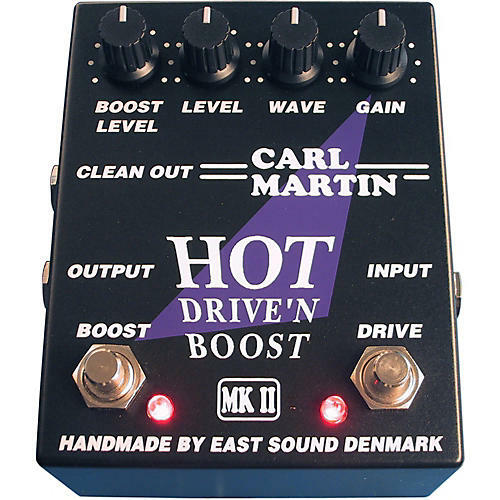 The Hot Drive'n Boost MKII is similar to the Hot Drive'n Boost but voiced with an extended frequency range one octave lower than the regular HDB. The result is more bottom end, sustain, and harmonics. The unit delivers an authentic '70s British sound, but cleans up nicely when you back off on your guitar's volume control. The Hot Drive'n Boost MKII also features both clean and distortion outputs for players who wish to split their signal into 2 amps. The boost feature lets you pump out up to 22dB more punch for solos that really stand out! Add this one to your Carl Martin collection today.